Kurt Ross on “Crazy Train,” on the lower east face of Longs Peak. 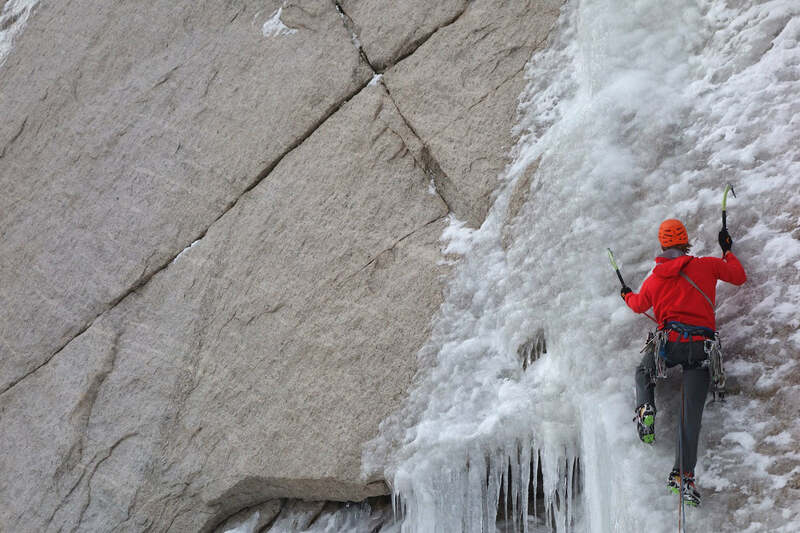 Hyperlite Mountain Gear Ambassador Kurt Ross is a renowned climber and videographer. A self proclaimed “dirtbag,” Ross spends as much time as possible exploring icy wilderness areas. Last May he climbed the Southwest Ridge of Mount Francis, the West Face of Kahiltna Queen, an unreported route on the South Face of Peak 12,200, Bacon & Eggs on the Micro-Moonflower and the French Route on Mount Hunter with various partners. 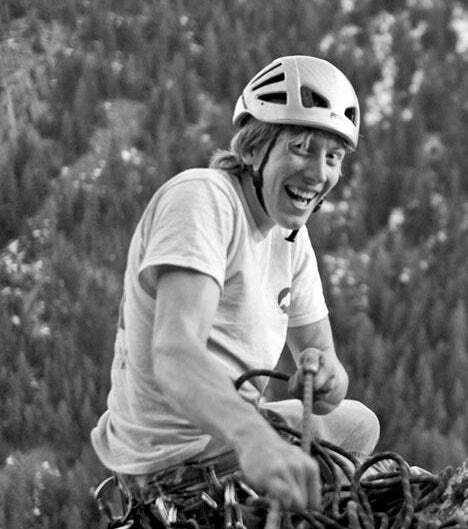 We recently caught up with him and asked him for his go-to alpine climbing gear list for serious lightweight adventures. The decision of what to wear on your person and in your pack for a big alpine objective can be as nerve wracking as deciding what to wear on a hot date with someone who’s way out of your league. Why did she agree to go out with you anyway? You’re an alpine climber; you have no social skills. She’s probably just doing a favor for your friend who set you up. Wait. Don’t be so hard on yourself. She wouldn’t have agreed to do it if she didn’t see anything that she liked in you. You may as well give it a chance. Like, cast a large net or whatever. What was I saying? People sometimes make fun of weight-obsessed climbers, but it really is important to cut as much fat off of your gear as is reasonable before attempting hard objectives. I’m not sure that breaking your titanium spoon in half and cutting the pockets out of your jackets is going to make the difference between sending or not, but I do think that general weight consciousness is worthwhile for big adventures. After all, the physical consequence of carrying every extra ounce is correlated to the the amount of spacetime you’ll be hauling it through. The simple unfortunate truth is that spending a bit more money to get that 900 fill, carbon, Dyneema®, helium filled stuff will make you a better climber/hiker/whatever to an extent. C’est la vie. If you believe that weight doesn’t matter because you only climb for yourself, that’s just great. I bet you have an excellent view from up on that horse, but like every other thing that humans do, just about every form of climbing is social and competitive. I doubt that you would spend your free time climbing on mountains if you were the only person on earth. You would probably spend more time trying to figure out what happened to everyone else. That would be weird. Do you think that will ever happen to anyone? Like, when the sun is burning out and the human race is on its way to extinction, someone will be the last person alive for at least a little while right? I would say that there are a few things that should be on every alpine climbing gear list, but I’m sure that this has been done plenty of times only to be contradicted by people with bolder visions. The only way to really figure out what’s necessary or extraneous is to climb a lot and experiment, especially since a lot of the weight budget for big routes is occupied by food and fuel, which is a very personal thing. My pack has surely gotten lighter as I’ve learned more about my required calorie & and water intake, but I still try to finish bigger objectives with some food and fuel packed away in case something like unexpectedly poor conditions or a bad fall or were to occur. I usually throw in an extra freeze dried meal and conservatively calculate fuel requirements for multi-day endeavors. Extra food probably isn’t necessary to like… survive in the case of unforeseen circumstances, but my brain works so much better when I have enough calories to burn that I like having enough of this stuff around to ensure that I can problem solve effectively. Owning nice gear doesn’t hurt, but good planning and critical thinking is even more important. I always try to be conscious of which pieces of hardware I use the most and least, so that I can consider what I really need for each type of objective. For example, the mega-guide Rob Smith will eliminate one carabiner from each sling that he carries on technically straightforward routes. Crusher Doug Shepherd will carry a smaller water bottle on routes that he knows he’ll be stopped at belays with time to brew. Steve House accredits his successful solo ascent of K7 to the radically light six-pound pack that he carried after making several heavier attempts. Josh Wharton doesn’t need to carry climbing gear because he’s Josh Wharton. For shorter routes in the lower 48, cutting the tags off your jackets might not earn you a ticket onto the send train, but as objectives get bigger, higher, and more far-out, cutting every superfluous ounce might be the difference between making a summit tag or returning to the real world with no arbitrary accomplishment under your belt. Sleeping bag for cold/dry or single night outings: Feathered Friends 900+ fill down bags or quilts for whichever temperature rating the current conditions require. Sleeping bag for wet/warm climbs: a lightweight synthetic bag. Shell jacket and pants (softshells for most outings, hardshells for very warm/wet conditions). Gloves: 2-3 pairs of various weights, plus mittens in most cases. Boots: I’m all about the Scarpa Phantom Guide & Phantom 6000 right now. Ropes: Usually doubles, sometimes a single for committing “up and over” routes. I would absolutely recommend Hyperlite Mountain Gear Packs even if I wasn’t writing this post for their blog. I use the 2400 ice pack for almost every outing. Kurt Ross also posts on instagram and his blog which can be found here and here, respectively. The post Pro Mountaineer Kurt Ross Shares His Alpine Climbing Gear List appeared first on Hyperlite Mountain Gear Blog.